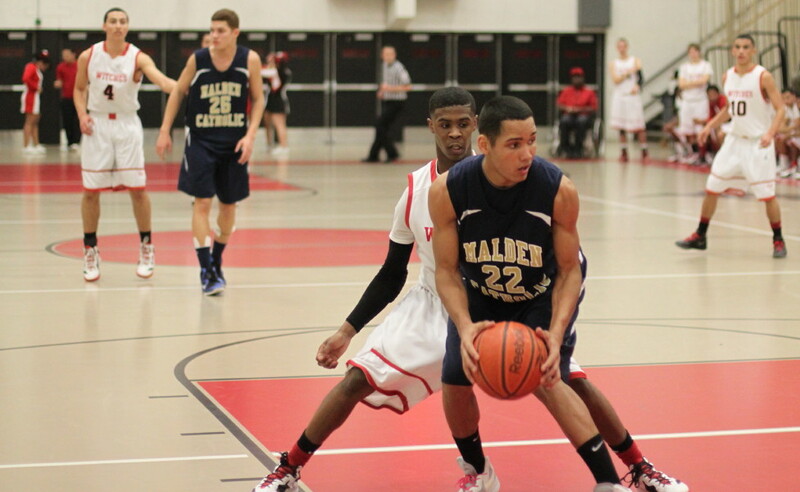 Marvin Baez (25 points) had four triples in the last quarter. 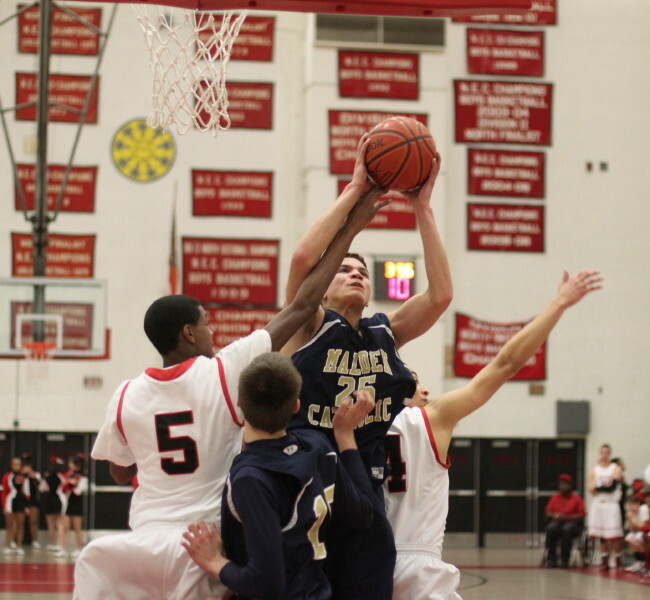 (Salem) Salem ousted Malden Catholic 73-68 in the preliminary round of the D2 North with as dramatic a second-half turnaround as you’ll ever see. The Witches (10-11) trailed by twelve (34-22) at the half and didn’t look capable of hitting enough shots to make things interesting in the second half. But right off the bat in the second half the shots started falling and they never stopped as Salem dropped an amazing fifty-one points on the visitors. The full-half burst of scoring gave the Witches more opportunities to pressure the Lancers, and it also gave the Salem crowd lots of plays to get excited about. A ten-point run got the deficit down to a manageable level by the end of the third quarter (47-46) and Salem took the lead for good (57-54) with 5:11 left in the game. Marvin Baez (25 points) hit more big shots in the final quarter than most players will make in a season. The Salem junior tallied fourteen points with four 3’s and a layup off of a steal in a display that the Witch fans will be talking about for a while. Marvin gave Salem its first lead (49-47) on his first long one of the final quarter. 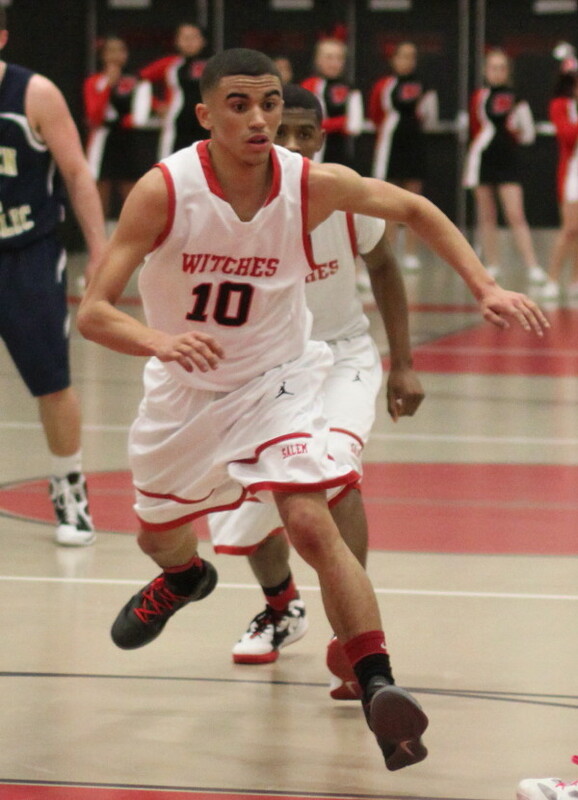 About 2 ½ minutes later his three with an assist from Christian Dunston gave the Witches the 57-54 lead they would carry to the end. Marvin’s last three put Salem in front 67-60 with 2:21 left. 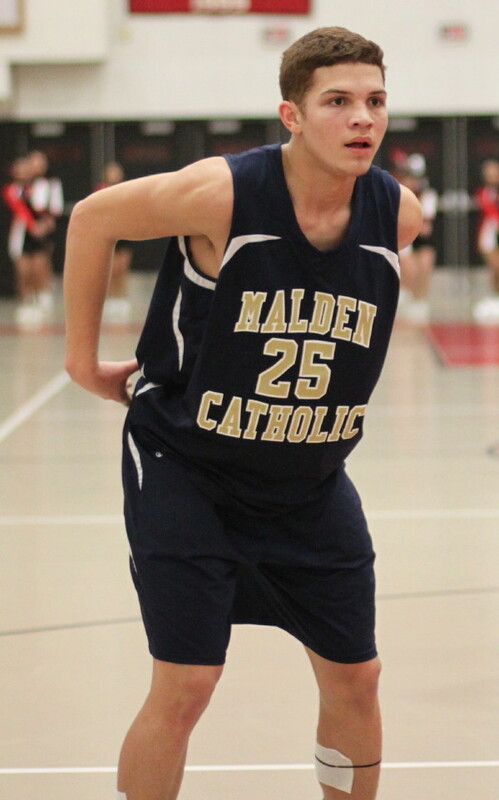 Christian Dunston (22 points) collected six points out of three pressure-packed one-and-one’s to keep Malden Catholic (9-12) from getting within one possession of the lead the rest of the way. Jered Lewis (20 points) had an awesome first half for MC. 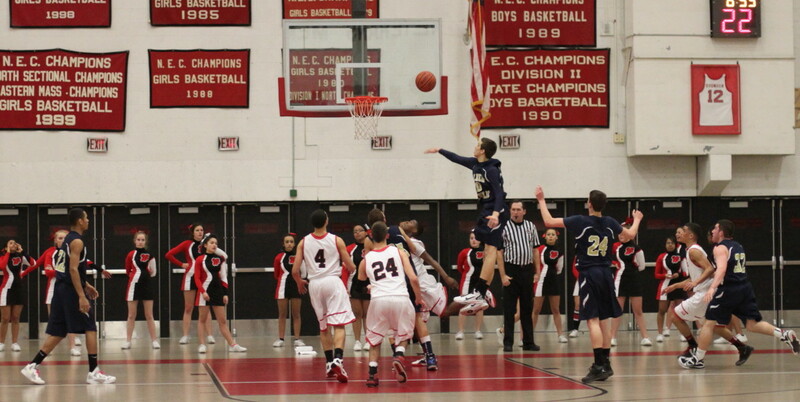 The 6-2 senior knocked down 3’s and converted rebounds to the tune of eighteen first half points. The Witches appeared to have no answers for him. Jered was limited to two points in the second half and really struggled with leg problems throughout that half. 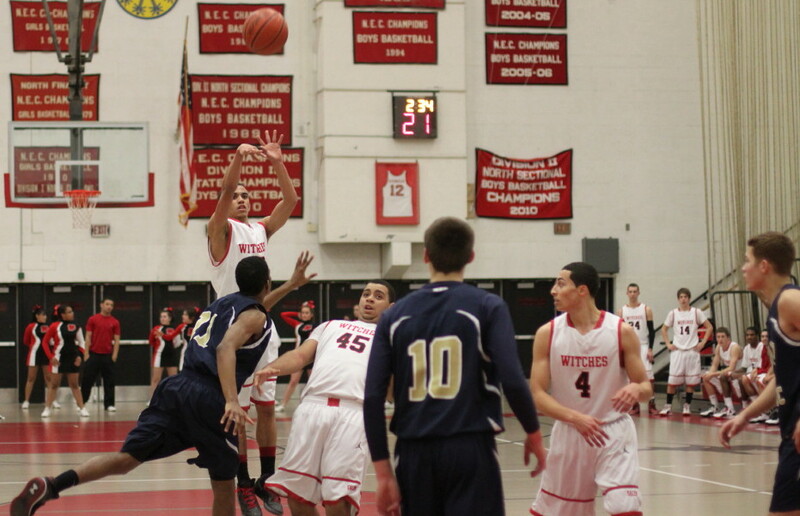 Minus his scoring in the second half, the Lancers hit several droughts that let Salem back into the game. The best run of offense for MC in the second half was after Salem put up eight straight to take a 52-47 led a minute into the 4th quarter. 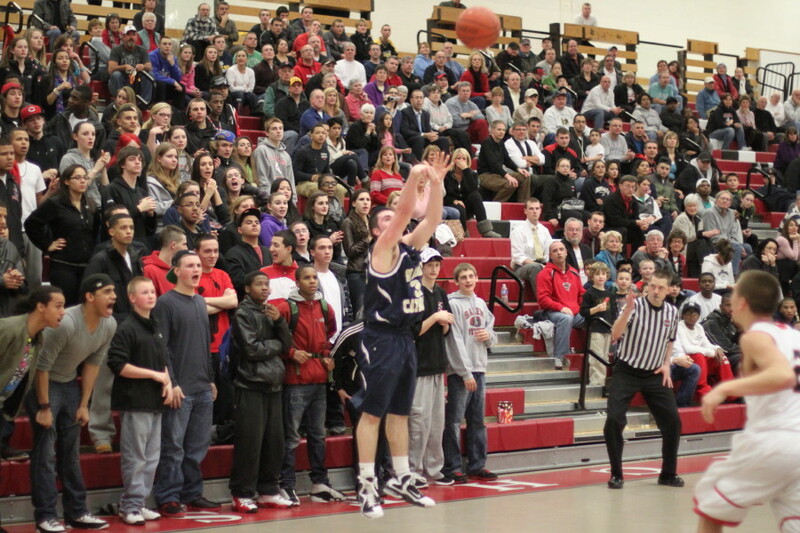 With a loud Salem crowd all over them, it would have been expected that MC would fall further behind. 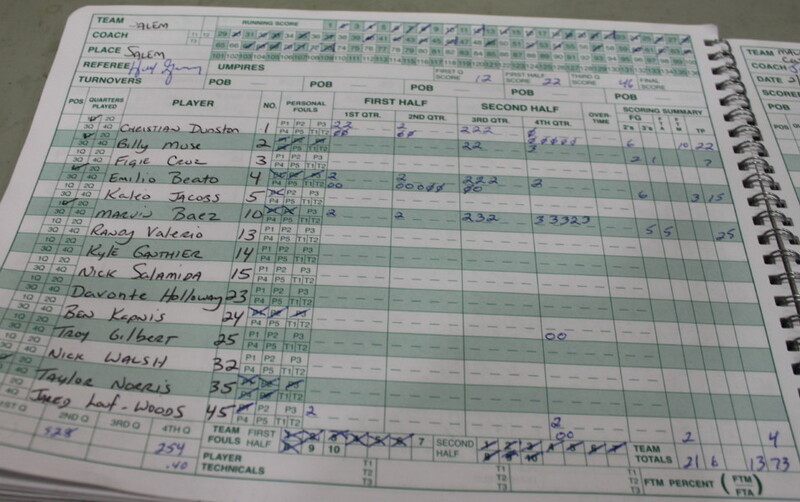 Instead they rallied for seven straight of their own and got the lead back, 54-52. A John Mastascusa (12 points) layup, two Kyle Sangster (17 points) free throws, and a Chris Philpot (14 points) long one provided the Lancer points in this surge. But Salem would regain the lead and never, after Jared Louf-Woods converted rebound with four minutes left, enable MC to have the ball and a chance to tie the score the rest of the way. The talk will be of the big scoring nights of Marvin Baez and Christian Dunston but Emilio Beato’s fifteen points were significant too. 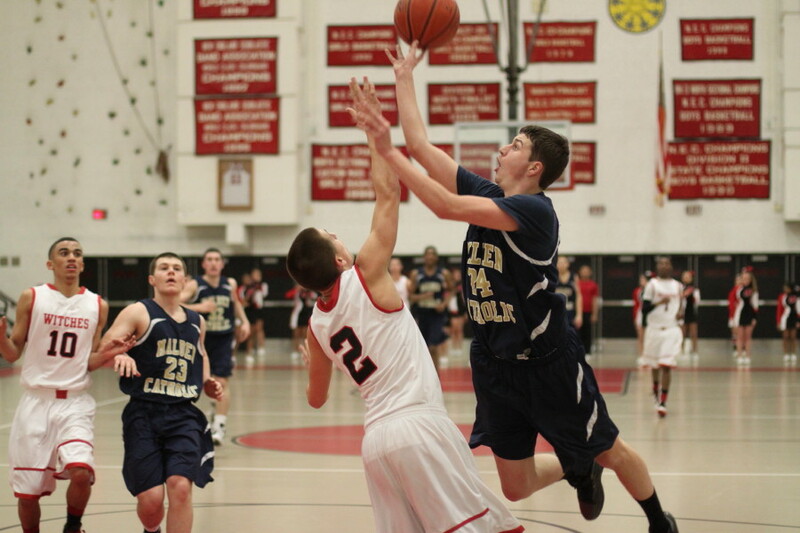 Chris Philpot had four 3’s for Malden Catholic. Turnovers were costly for the Lancers. They had nineteen through three quarters. That first half lead (thirteen points) could have been much higher with better care of the ball. 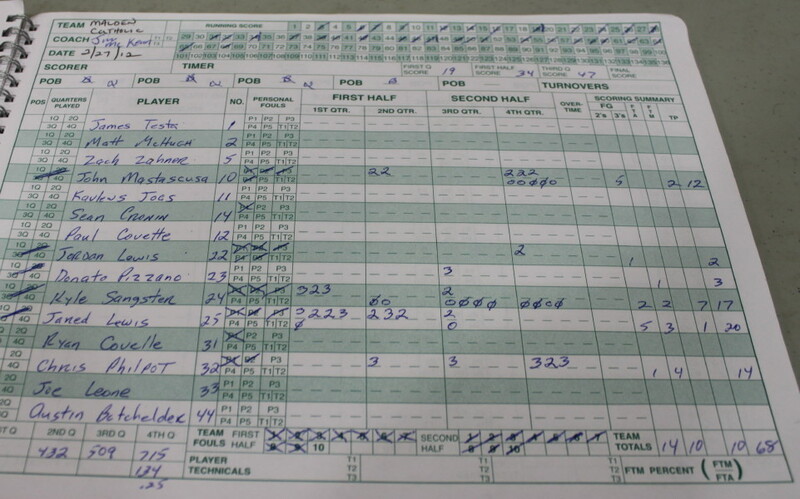 The turnovers in the 3rd period were of the very costly variety where Salem had breakaway layups from them. 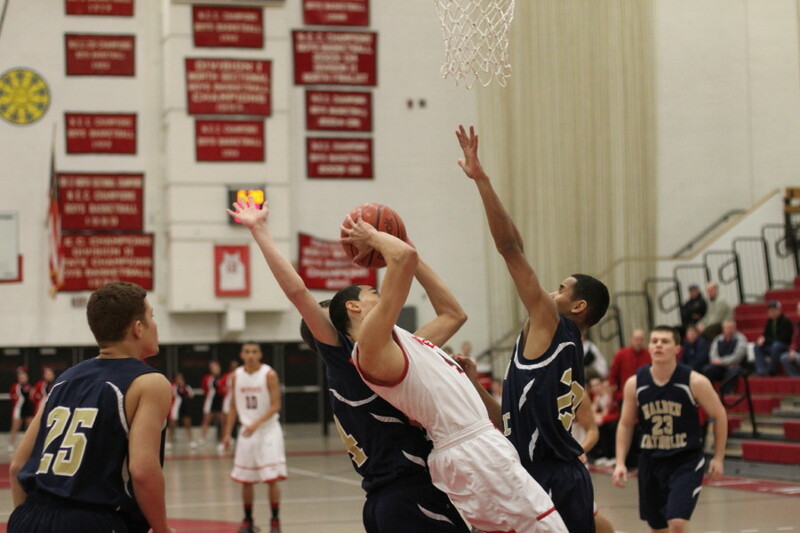 Salem (#16 seed) gets to play #1 seed North Andover on Thursday night (7PM) at Lawrence High School. The NA coach just “happened” to be at the game tonight.